Golden Green Premo! 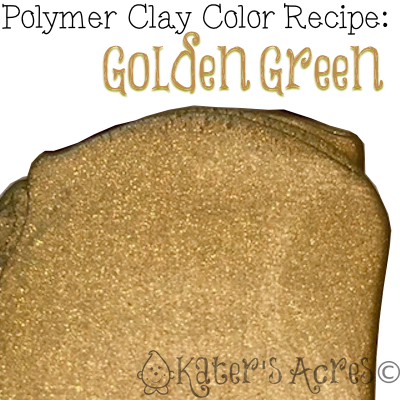 polymer clay color recipe is that touch of old gold. As an illustration, gold that has tarnished with age. Surely reminiscent of pirate’s or fool’s gold. Indeed this is a unique color with attitude! This polymer clay color recipe is the perfect metallic to spice up Steampunk designs & metallic old world pieces. Last week I brought you a deep Dark Waters color recipe that was made for the depths of the ocean. First of all, nearly black colors are needed in every palette to add depth and a sense of mystery. In addition to nearly black colors, today’s color is another rich color that will add intrigue but also sparkle. While metallic colors in the Premo! by Sculpey line are definitely NOT lacking, making your own sparkling colors are truly a wonderful gem (see what I did there … sparkling … gem?!). Mixing opaque colors into metallics to make a new rich metallic are a great way to add a new twist to the “same old” metallic you’re used to using. Most noteworthy about this Gold color is that the Gold has a natural yellow pigment. So by adding the Cobalt you achieve an instant green shade. In addition, the Wasabi in this palette is acting as a brightener so that the palette stays light and doesn’t darken excessively. Pretty cool if you ask me! Overall, I really like this color and this recipe. In conclusion, variations on this color recipe are given for you below. Add 1 parts additional Cobalt for a deeper green tint. Add 2 parts additional Wasabi for a brighter golden sheen. Add 2 parts more Cobalt for more of a green tint. What a lovely colour Kate. Have you ever tried to make a nice orange pearl clay recipe at all? That would be such a summery clay to use. Also if you use the search bar you can find a “Kissable Orange” that you might really like as well.